ATTENTION: WIN A FREE TRIAL OF JUST RIGHT OFFERED AT THE END OF THIS BLOG! Choosing a dog food from a hundred different options down the pet food aisle can be a little overwhelming…if you’re ADHD like me, just consider that a lost cause. Lord help you if your dog has special food requirements. When you first take on the challenge of trying to find the perfect dog food, you should always start with reading the ingredients and trying to get the one that speaks the most English. Often times you get home and all you really know is that you made it home with a bag of dog food that weighs as much as you do. If you’re single it may be a horrible monthly reminder of how you don’t have a boyfriend to lug that thing inside for you (REMINDER FEMALES: You are a strong independent woman! 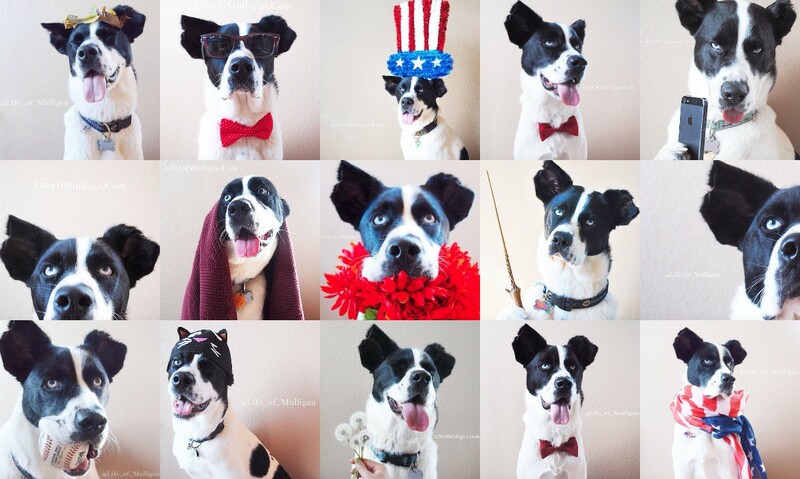 All you need is your dog…and Netflix!). Plus I should also mention just because you are dating someone / married to them still doesn’t mean they will lug that thing inside for you, RUDE. 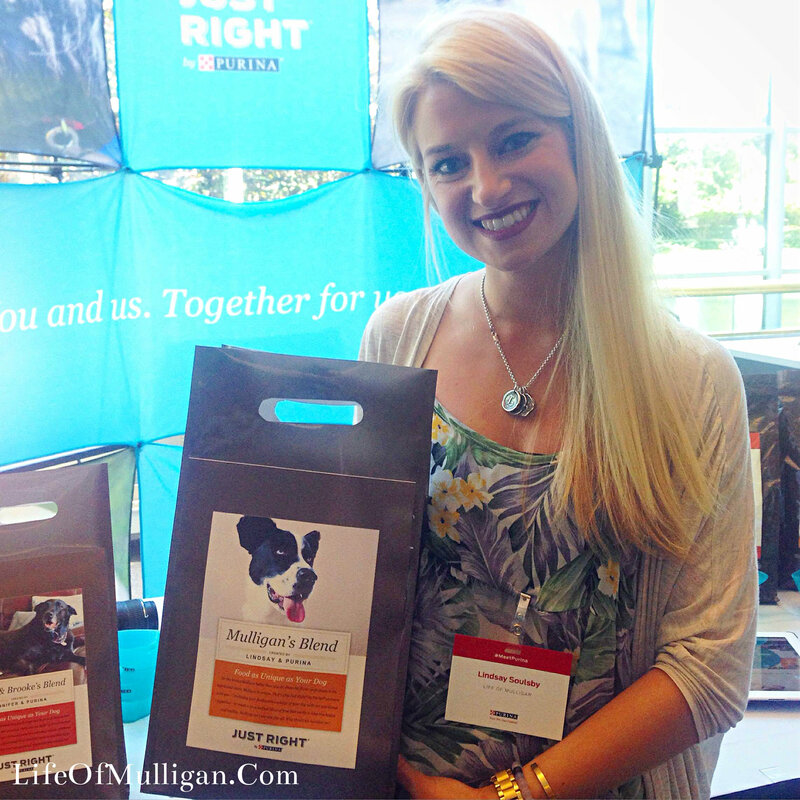 This is why when Purina gifted me a bag of “Just Right” pet food, with Mulligan’s picture on it at the Meet Purina event, I wanted to learn more about this unique idea & brand! 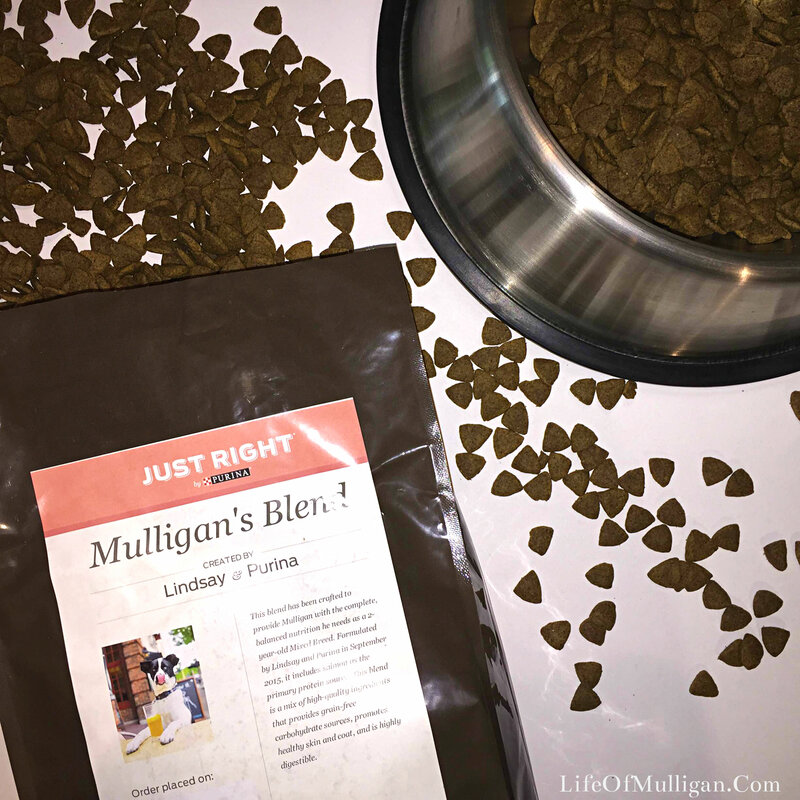 Just Right pet food allows for you to create a blend just as unique as your dog! Custom designing & engineering your dog’s blend to meet every individual need. Creating a blend is easy, & only takes three simple steps! This is where you describe your dog’s basics! 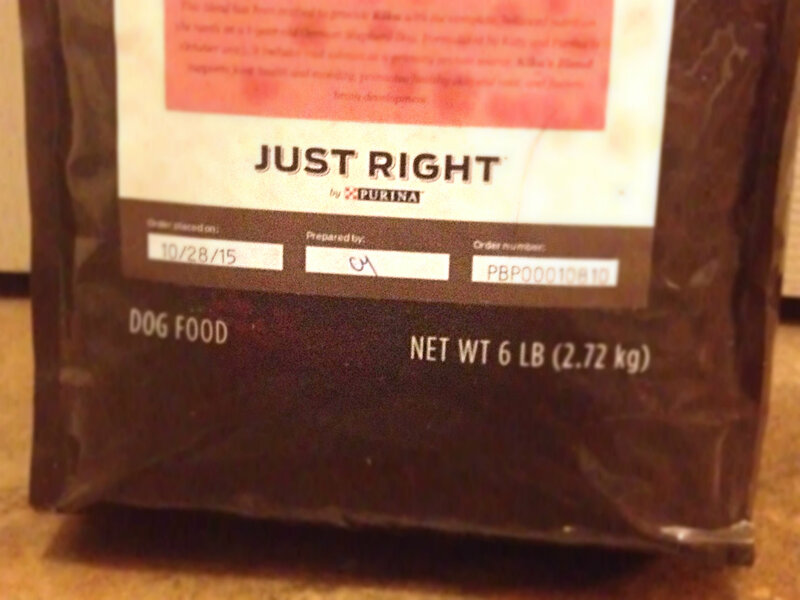 Here Purina makes a point to hit on every individual need / preference for your dog’s ideal food! Purina asks different questions, targeted around the ability to optimize a premium dog food designed to meet individual needs. All you have to do is provide the answers by moving the scale to where it describes your dog best! We do “no wheat, no soy, no grain” at our house, but you do you! YOU CAN PICK YOUR DOG’S FAVORITE FLAVOR TOO! 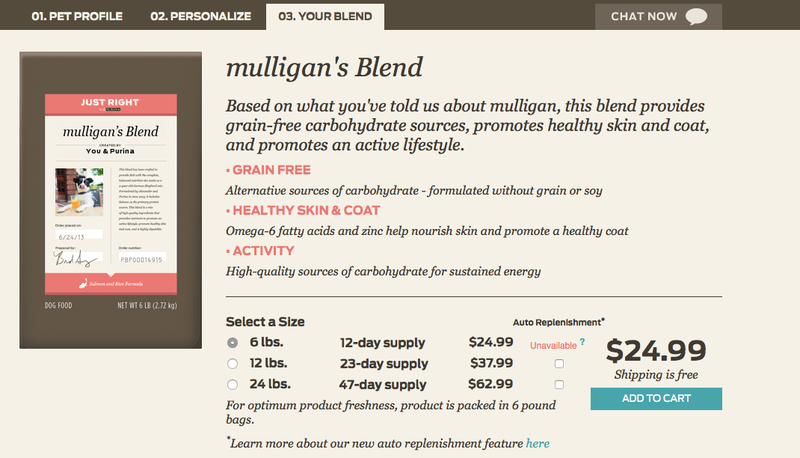 Salmon – This was my protein choice for Mulligan’s blend & he LOVED it!! THE BEST PART IS YOU CAN CUSTOMIZE YOUR DOG BAG, MAKING IT A SPECIAL SURPRISE WHEN IT ARRIVES!!!!!!!!! 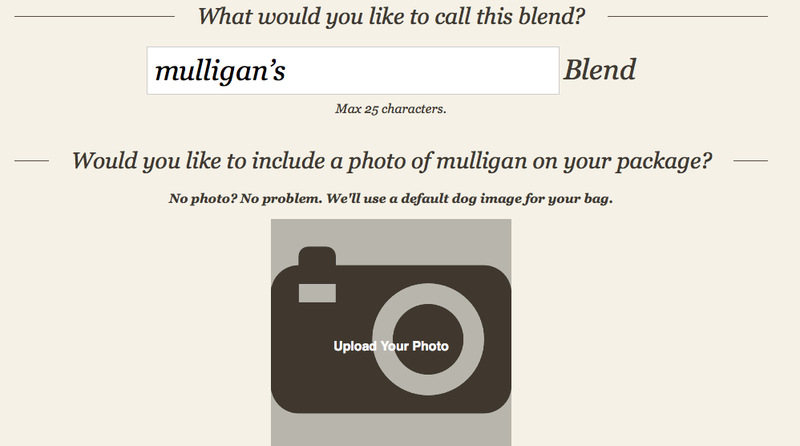 Not only do you get to name your dog’s blend, BUT YOU GET TO HAVE THEIR PICTURE ON IT…YES, PLEASE!!!! I mean seriously, who doesn’t want to see a picture of their dog(s) on the front of a bag of dog food? That’s celebridog status! Step 3: Approve your custom blend! Here you can see the final product all put together for review! Just Right experts also offer suggestions on feeding your dog based on the information you provided them. Did I mention I really like to see Mulligan on the bag?! But what crazy dog mom wouldn’t?! There are several great things about Just Right pet food beyond the attention to detail when designing a custom blend for your dog. Orders come with several different small bags inside. This insures the freshness of the blend AND if your travel with your dog a lot, or take your dog to work everyday like I do, having several small bags makes a difference! You can easily keep bags at work, or throw a bag in a suit case for travel! 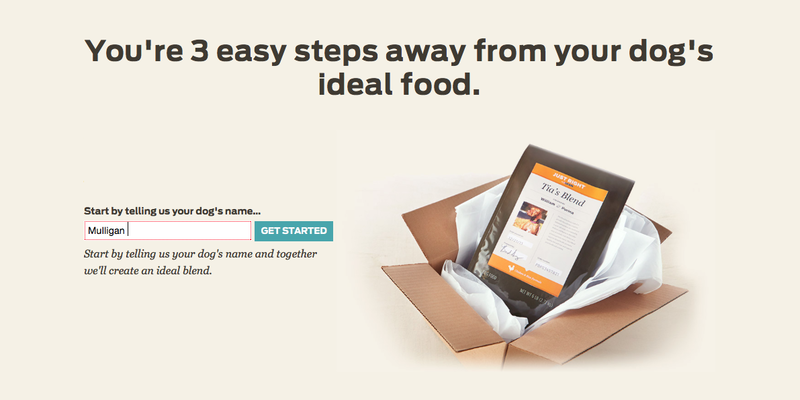 You can even schedule orders SO YOU NEVER RUN OUT OF DOG FOOD AGAIN! You don’t even have to leave the house to make an extra trip or carry that big bag, it gets delivered straight to your front door! What I really love is how personable the brand is! Each and every bag has a signature on it of which employee assembled your order for you! 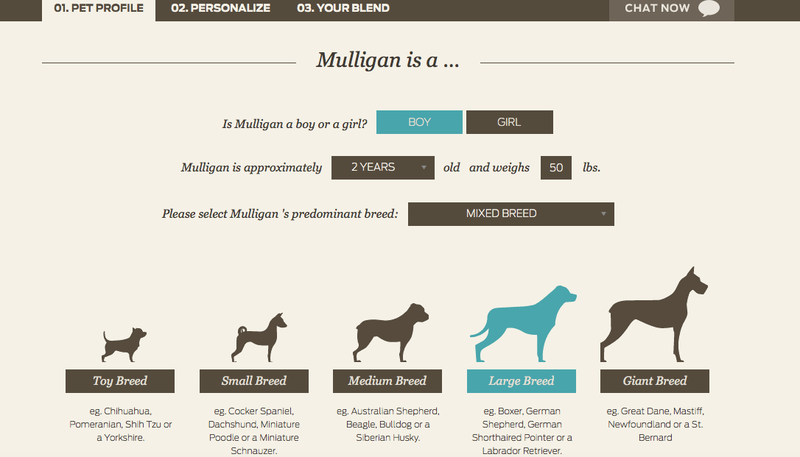 Mulligan LOVED his blend & so did my friends German Shepard, Kika, that we ordered a blend for! Want to try a FREE supply of Just Right pet food? Of course you do! Here’s how! OR Share the Facebook or Instagram post! (2) Comment below to let me know you’ve done so & a little bit of info about your dog! (4) One lucky winner will be picked next week! I tagged friends on instagram as Marley_Kristin. I have four rescue dachshunds and they are all around 7 years old. They are active and love to play with toys. I try to feed them the best food I can find. Love to hear that you have FOUR rescues! That is so wonderful! I would love to provide you with the FREE order of Just Right pet food! Please email me at LifeOfMulligan@Gmail.com!